Here are some thoughts about the Edsel, failure, success, and crowdfunding, which some entrepreneurs will hopefully find helpful along their respective paths to success. We’ll never succeed if we never try. Trying hopefully results in success but, since nobody’s perfect, it sometimes results in failure instead. Failure is a natural part of this mortal life, including in business ventures. Many newly-available products/services (or even entire businesses) fail every day. Although such failures can be stumbling-blocks for some entrepreneurs, they can also be stepping-stones for others who choose to nurture the right attitude, which includes humility and faith and patience. There’s never a valid reason for us to give up on pursuing a dream, I understand, except to the extent that we discover ourselves treading the wrong path—and our persistence (in trying, in learning, in improving, and in increasingly pursuing the right path) constitutes a vital key to our ultimate success, even if that success requires more time than we’d like, and doesn’t always come in the form that we’d originally expected. 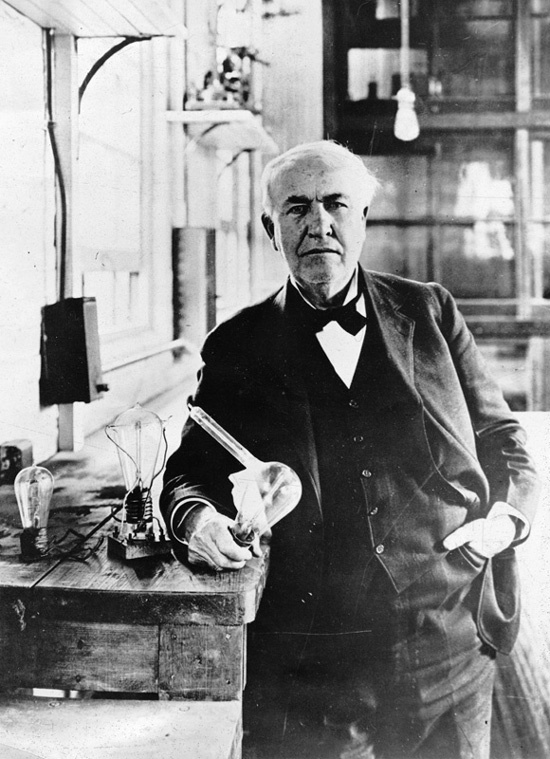 Let’s please remember that the famous inventor Thomas Edison persistently tested thousands of different incandescent lamp filaments before he finally identified one material that was sufficiently durable (and cost-effective) for residential use. Ford’s Edsel has become a popular symbol for failed products, and deservedly so. During the 1950s, Ford had already enjoyed a long series of great successes in both low-priced and high-priced cars, and it was interested in extending those successes into the mid-priced car market also—and, so, its executives decided to create a perfect premiere car for middle-class Americans. Unfortunately, their hubris impeded their efforts from the start. For example, although they hired the best market research available, they selectively ignored it (unlike for previous Ford cars) in favor of their own personal hunches. Also, their refusal to consider failure as a possibility ultimately resulted in severe overproduction. Moreover, they generally neglected this car’s engineering to focus persistently on its marketing, thereby putting last things first. 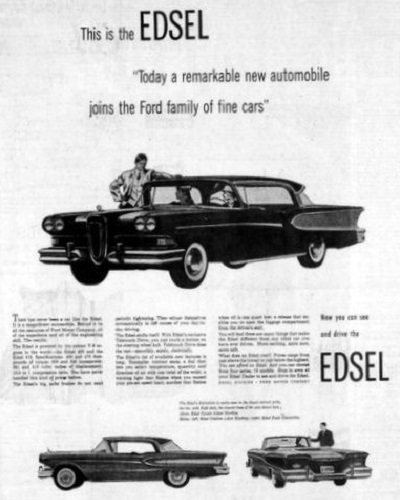 The Edsel’s marketing is perhaps the only thing that Ford actually got right about it. Ford skillfully exercised amazing showmanship—perhaps some of the best during that “golden age” of advertising—to generate tremendous “buzz” about the Edsel for an entire year through ads, news, and even a top-rated television special, while persistently teasing the public with fragmented glimpses of its carefully-kept-secret design. When Ford finally unveiled the Edsel in late 1957 on “E-Day” (as Ford’s marketers had dubbed it), curious shoppers sometimes lined up around-the-block to see this amazing new “car of the future” that they’d heard so much about. Sadly, those showroom visitors generally felt disappointed as hype finally dissipated into reality, and the REAL Edsel proved to be nothing more than an over-hyped overpriced ugly gas-guzzler that attempted (but failed) to please everyone and quickly developed a reputation for unreliability. 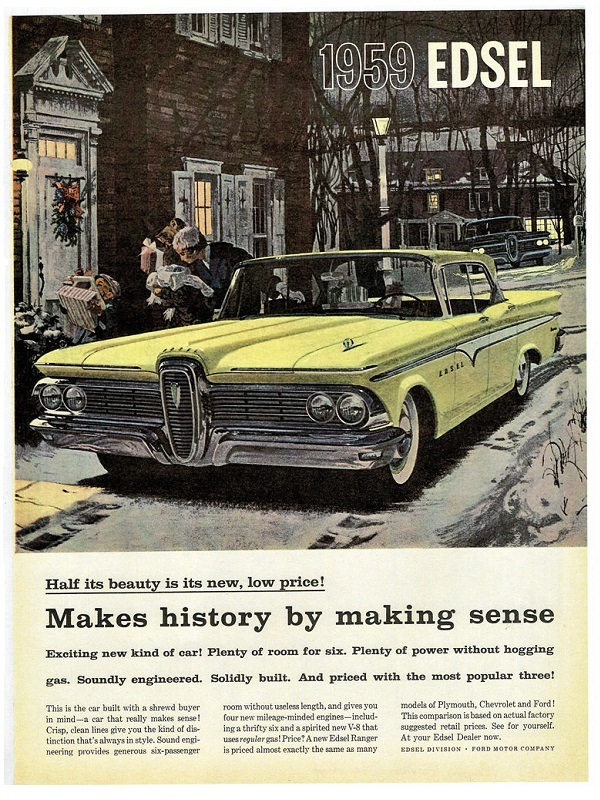 A simultaneous economic recession that contributed to a sudden shift in consumer preferences toward compact cars didn’t help Edsel sales, either. And, ultimately, no vast army of skilled salespeople, advertisers, and PR agents could polish away its obvious flaws. For these and other reasons, the infamous Edsel ultimately proved to be “the wrong car for the wrong market at the wrong time” and, after it lost Ford over $250 million dollars over two years, this car-turned-joke finally drove out of showrooms into history as one of the most spectacular new-product failures EVER. Thankfully, Ford survived this debacle to continue its string of successful new cars, including its renowned Mustang in 1965. And, partly due to such successes, even Ford’s Edsel eventually gained some popularity as a collector’s item. 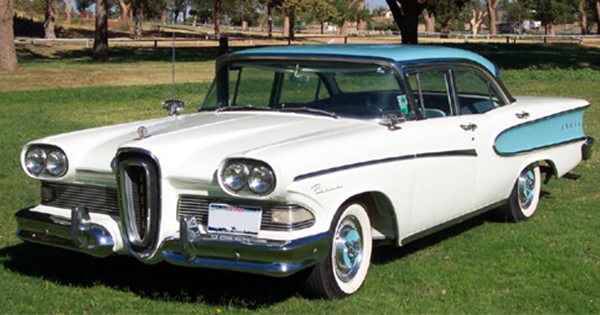 You may read more about the Edsel’s sad saga both here and here. Unfortunately, the Edsel team seemingly never learned from their $250 million mistakes, or even accepted that they’d made such mistakes—in fact, Edsel marketing manager J. C. Doyle once even publicly berated car-buyers for refusing to accept what Ford had given them, as he insisted that they should have done—but WE can (and should) learn from such mistakes to avoid repeating them. So, what lessons can we learn from the Edsel project? One lesson may be that, whereas pride goes before the fall, humility is key to both learning and progress. Another may be that businesses exist to serve customers, not the other way ’round, and that “the customer is always right.” A third may be that trying to please everybody may result in pleasing nobody. A fourth may be that timing can be important, and that consumer preferences change over time. A fifth may be that hunches are no substitute for facts (and that, when you’ve done something right repeatedly before, you should keep doing it). A sixth may be that, when reality is proving that you’re mistaken, then it’s good to accept reality quickly before you’ve wasted $250,000,000. A seventh may be that a superior product-and-price combination is always the single most vital factor in sales, no matter how skilfully presented and/or promoted it may be—and, similarly, that even the best marketing can only do so much to sell a bad deal. And perhaps one final overarching lesson from the Edsel project is that, even though it failed spectacularly, Ford as a whole kept moving forward, as should we all. Which brings us back to where this blog entry began. So, if your spend years carefully designing a product until you finally reveal it to the world only to discover that what you thought was a figurative Mustang is (oops!) actually an Edsel… then it’ll be alright, as we stated in a previous blog entry. Just carefully reconsider your project’s product-and-price, presentation, and promotion, in that order, and then “pivot” accordingly. If you’d like to consider these (and other) success factors in greater detail, then we invite you to please examine another past blog entry that overviews our 7 P’s for Crowdfunding Success, so that you may hopefully learn from our years of experience rather than from your own mistakes. The best way to benefit from our experience, though, is to hire us—so, if you’ve got a crowdfunding project coming to (or already launched on) Kickstarter and/or Indiegogo, and if you would like some expert help to present and/or promote it, then please apply for our services right away!